Today, we are going to talk about different ways of storing your Bitcoin. Nowadays there is a huge variety of wallets, and most of them look the same as a casual paying system wallet, but some of them are kind of unique. Those wallets are special, because of the major structural features of the Bitcoin network. As it was mentioned earlier, all wallets have different types of functioning. There are five basic types of wallets: desktop wallets, mobile apps, browser, paper wallets and purses gadgets. In this article, we are going to attend each of it more detailed. If you already have installed original client of Bitcoin system (Bitcoin core), you already have installed the Bitcoin wallet. Moreover, you even can do not know about it. Despite making transactions, this software creates Bitcoin account, so it is possible to send or receive cryptocurrency. And you can store private key for this account. There are also other wallets, which are as additional software, but with some additional functions. Multibit is available on such operating systems like Windows, Mac OSX, Linux. Some of these wallets have expanded functionality. For example, you can use app store that allows you to make different transactions between Bitcoin users. Some of desktop wallets were created to increase safety. For example, Armory-wallet is from this category. But some people prefer anonymity. So the best solution for them is DarkWallet. It is small browser extension which was created to provide different services, including the "mixing" of cash flows from other people using the software and, of course, protection people from tracking their operations. It works the next way: you send money from wallet A to wallet B. Another user makes one more translation from wallet C to wallet D. So after all transactions your amount is on D wallet, and money from C wallet is on B wallet. There is no any connection between you and D-wallet owner. As we see it is really hard to track “who” and “where” sent money. Actually, the main scheme is more difficult, but genera principle looks like it was shown earlier. As we can see desktop wallets is very good kind of your Bitcoins storage. Despite its popularity, it is not useful when you are on street or trying to pay for something at local shop. This is exactly that situation, when mobile wallets are great solution. When this wallet is installed on your smartphone as an application, this app can keep private keys from your Bitcoin address and allow you to pay for everything from your smartphone. Often this program even makes payment processes easier, because some mobile apps let you pay in few clicks. That means that you don`t need to enter all information. One common feature of mobile wallets is that they do not need a full download of all the blocks. Bitcoin desktop client should download all the blocks of the entire network, and it grows all the time. So it is few gigabytes in size. This can create you many troubles. And as a conclusion, your mobile operator will be happy, after sending you bill for used traffic. In addition a lot of mobile phones can`t allow such huge amount of information, because of memory limits. Instead of downloading full entire network blocks, mobile phone applications are designed for simplified method to check payment. So program download only small part of blocks, and all sent funds authentication is done on other trusted nodes of the Bitcoin network. As representatives of Bitcoin wallets on mobile platform can be Micelium, Xapo and Blockchain (which holds the Bitcoin keys encrypted on your phone and making backups on a Web server). Apple is famous for its dislike to Bitcoin wallets and cryptocurrency at all. For example, mobile version of Coinbase was expelled from the App Store in November 2013, and the same situation with Blockchain IOS applications in February 2014. However, in July 2014 Bitcoin wallets began to appear in the IOS store. Since that moment, all developers have released new versions of their previous applications. There are other types of wallets, which may be used on mobile devices. For example, browser-based wallet, CoinPunk is developing now. Another unusual wallet Aegis Bitcoin Wallet is available on Android smartwatches. Web Wallets store private keys on the server of the company providing such services, which is constantly connected to the Internet. Some of these online services are available for use, and some of them connect your desktop and mobile wallets, by spreading your Bitcoin accounts between different devices that you own. One of advantages of e-wallets is that you can have access to your Bitcoins anywhere. And it doesn`t depend from device you use. But there is still one disadvantage. You don`t store all your wallets, so if somebody extraneous or dishonest employee get access to your account you can lose all your money. Using these companies, you trust them your own money, which you can lose because of “third” person. It sounds very scary, especially when you have a huge amount of Bitcoin on your wallet. Coinbase it is Bitcoin Exchange, which is integrated with a wallet. People from all over the world can buy, exchange and send Bitcoin using only one website. 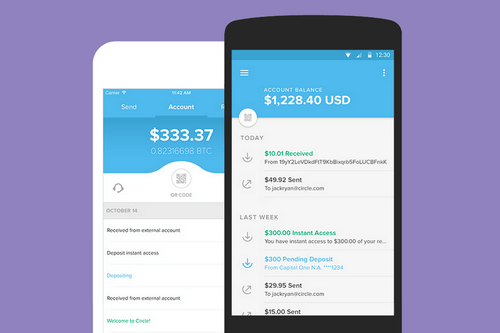 Circle offers to their customers’ ability to store, receive and buy Bitcoin all over the world. But nowadays only, US citizens can use bank accounts to deposit funds. Users from other countries can deposit funds only using credit or debit cards. Blockcahin probably is the most popular web wallet. It allows sending and receiving Bitcoin in a very short term. They use multi-factor authentication for sign-in and payments that increases the safety from third-person intervention. Xapo is convenient and simple service that provides store service for your Bitcoin. And several added features provide additional security. Offer of wallet gadgets is extremely small nowadays. In this case, it is small, specialized devices working as wallets, which may contain private keys electronically and make payments easier. Price of wallets ranging from $ 30 to $ 150.You can order it in Western internet stores. These gadgets may work as a flash memory or devices with remote control and signals. Nowadays developers are designing new versions, which will recognize fingerprints or heart rate. These devices will be popular at those who keep a very large amount of Bitcoin. Despite a huge level of security, you can lose or damage one of these devices. Moreover, this mean that you can lose access or even all your money. So here, our review of Bitcoin wallets is done. If you want to buy or make an exchange of your Bitcoin for cash with great rates, we would recommend popular exchange service 24xbtc.com.